The National Public Security Council (CNSP), the government agency in charge of violence prevention, says the typical age of entry has gone down from 14 to 12. And a U.S. State Department report presented to the Inter-American Commission on Human Rights says the maras recruit children as young as nine years of age. According to Óscar Bonilla, president of the CNSP, the cliques, which control specific areas within neighbourhoods, offer "brand-name shoes and clothes, money and anything else that is attractive to kids." In his view, the strategy is two-pronged: to rebuild the strength of the gangs, many of whose members are in prison, and to recruit members who are too young to face legal charges. Sixteen years after the end of El Salvador's civil war, the whereabouts of hundreds of children who disappeared during the conflict remain unknown. 29 March has been designated as the "Day dedicated to the children who disappeared during the internal conflict" in El Salvador. Yet the country's government has done little to reunite the missing children with their families, despite an international ruling obliging them to do so. Of more than 700 children who disappeared in the conflict (1980-1992), around 330 have been located, largely due to the work of a local human rights organization. The rest still remain unaccounted for. Ernestina and Erlinda Serrano Cruz, sisters aged 7 and 3, are two such victims. They were captured by the Salvadorean army on 2 June 1982. After the war, the girls' mother submitted a complaint about her daughters' kidnapping. A complicated tale of law, science, sick children, environmental concerns, and politics is playing out in El Salvador's legal system. Regular readers of this blog will remember the situation of Record Batteries -- the company which operated a facility for recycling lead acid batteries in the western part of El Salvador. El Salvador's health ministry shut down the plant last September. The closure followed a campaign by environmental groups, human rights organizations, politicians and media stories. (More here). While that action may have been the end of the factory, it was only the beginning of legal proceedings. Investigative journalist Jorge Avalos described in a lengthy article how the closure had been filled with legal gaps, and, perhaps more seriously, the sudden closure left a warehouse full of partly processed toxic materials creating a new environmental hazard. Somehow in the four Holy Weeks which have happened since I have been writing this blog, I have failed to describe the tradition of "alfombras" - carpets -- created in the streets of the country during Holy Week. The alfombras are made by families, groups or organizations with salt and sand and make intricate, and temporary, works of beautiful art where Holy Week processions will soon pass. Two of my favorite Salvadoran bloggers devoted posts this past week to the alfombras with many pictures of this year's art work. The post by my friend Hunnapuh can be found here, and writer and poet Nora Mendez offers her photos here. Monsignor Oscar Arnulfo Romero was assassinated the afternoon of Monday, March 24, by one shot. I do not believe that the crime will be resolved under the current circumstances. Above all, I believe that no one will be indicted as a result of the work currently being done. Collection of videos from El Diario de Hoy. Photo at top by Rene Aguiluz on Flickr. The right to water is a fundamental human right, essential for the realization of a life of dignity and a precondition for the realization of other rights, in as much as water is a determinant of public health and thus for the rights to health, to environment, to food, and to enjoyment of an adequate standard of living and all other rights. It is essential to have water in sufficient amounts and quality and treatment and sustainable exploitation, to meet the core needs of the population and to ensure the good health and proper development of present and future generations. While internal power struggles between different "cliques" in the gang might be behind the murders, it should not be forgotten that the killings occurred "basically because of the overcrowding," the "lack of rehabilitation programmes" for prisoners and the deplorable conditions in the country’s jails, said Nelson Flores, coordinator of the Penal Studies Centre (CEPES) in the Foundation for the Study of the Application of the Law. (FESPAD). La Prensa: Holy Week | Vacations 2008El Diario: Holy Week | Vacations 2008Go to any of these sites for video and photos of the religious and secular celebrations of this week. El Salvador's governing ARENA party has chosen Rodrigo Ávila as its candidate to run for president in March 2009. The former director of El Salvador's National Police will face Mauricio Funes, the former TV news interviewer who is the candidate of the leftist FMLN. Rodrigo Ávila was most recently the Director of the National Civil Police during 2006 and 2007. He previously served as the Vice-Minister of Public Security and as a member of the National Assembly. Prior to his service in the National Assembly, he served at various levels in the National Civil Police including being the director from 1994 through 1999. Avila graduated from North Carolina State University Raleigh, with a degree in industrial engineering and has a degree in mathematics and business administration from Gainesville College in Georgia. (Official bio from the office of the Salvadoran president). I'm walking through nature's mini-bar, though taking a cocktail in this heat would be suicide. My guide, or barman as I'm tempted to address him, stops again as we heave ourselves through the viscous floors of the ascending forest. He plucks a spindly white plant out of the ground. This time of year, a number of stories appear in the press about college students using their school breaks for projects in El Salvador. New Year's Eve in Nejapa, El Salvador, looks a lot like the Fourth of July. At Griselda Guzman's house, homemade fireworks lighted the front yard, where the guests dancing outside her pale yellow home included 11 University of Wisconsin-Madison engineering students and three advisers. Students from the UW-Madison chapter of Engineers Without Borders spent their winter break in El Salvador to begin construction on a gravity-based wastewater system that will link two nearby communities to the sewer system in the larger city of Nejapa. [Eleven year old] Marlon, however, declares he "will not go with the gangs anymore" because of Barefoot Angels, an organization which works in Santa Ana, El Salvador's second-largest city, which attempts to help youths cope with violence and keep them out of gangs. The team of seven professionals, headed by Lucy Guzman, includes social workers, psychologists and educators and for the last ten years has tried to provide a refuge for children from the fear of violence. Trinidad -- director of a homeless shelter in central San Salvador. Yesterday, March 8, was International Women's Day. To celebrate, the online version of La Prensa Grafica posted an inspiring gallery of portraits of Salvadoran women. 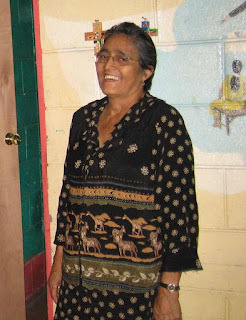 I have met many strong and courageous women, young and old, in El Salvador. The country owes much to them. This post represents a milestone. It is post number 1000 since I started the blog. Help me with ideas for the blog going forward. Add a comment to this post letting me know what you would like to see in the next 1000 posts. What topics do I pay too little attention to? What would make the blog more useful? I'm also interested in anyone who wants to be a guest blogger. If you think you would like to contribute to the blog from time to time, please let me know. You'll start noticing some changes in the right hand column over the next few weeks. Starting today, for example, there is a topical index in addition to the date archive. (Unfortunately I have not yet assigned a topic to a large number of the 1000 posts). I will be creating updated lists of blogs, news sources, and solidarity organizations. I also plan to update some of the pictures on the site. Henry Fuentes closes his eyes and tries to sleep. But he can't. He is restless. He looks out the airplane window. This may be the last time he sees the United States. In less than three hours, he will land in El Salvador, a country he hasn't seen in eight years. Fuentes hadn't planned on returning. Immigration agents arrested him at his Houston apartment last month. Now the government was flying him and 115 other illegal immigrants back to Central America. Some had just crossed the border. Others, like Fuentes, had spent years in the United States and held jobs, owned cars and started families.